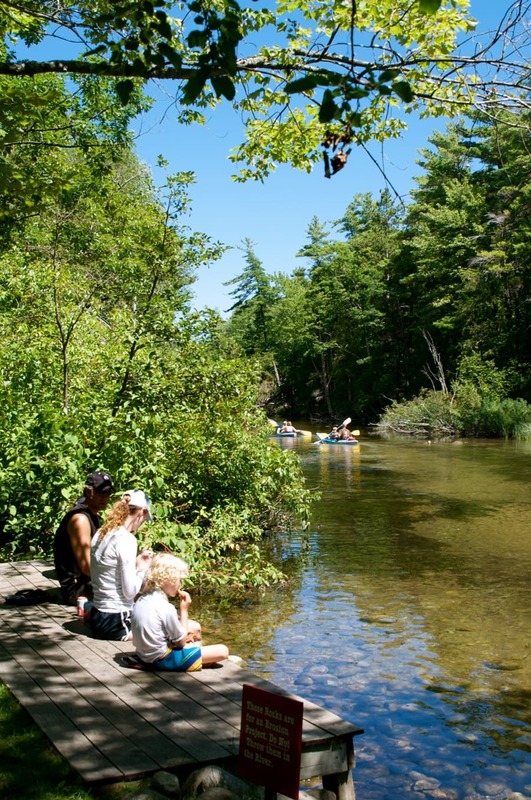 Novice paddlers and children can handle the gentle current on the shallow Crystal River in Glen Arbor, and everyone will appreciate the clear water and sandy bottom. The staff at Crystal River Outfitters will hook you up with a kayak or canoe and take you seven miles up the river to a picturesque spot where Fisher Lake narrows to become the river. Your paddle back to Glen Arbor will take 2–3 hours. You’ll make an easy portage, and shoot the famous tube—everyones favorite part of the trip. Watch for wildlife—the warm river waters are full of bass, sunfish and pike, and the riverbanks are home to deer, rabbits, muskrat, heron, beaver, fox and coyote. When you come to three culverts running under the road, it’s time to shoot the tube. You could opt to portage, but it’s way more fun to point your bow at the middle of the three tubes (make sure everyone has a life vest on, fastened tightly), pull in your paddle, hunch down low and let the current whisk you through. You’ll shoot out into swirling water on the other end. Paddlers have been shooting these culverts for more than 50 years, and the worst anyone has come out is wet. The best swimming hole on the river is just downstream (you’ll spot it at the end of a short dirt road). Swim, sun, and snack, then push off. There’s one more portage and then it’s back to Crystal River Outfitters. Next door at Riverfront Pizza, order lunch and eat at a riverside table. MyNorth is your guide to summer fun. Click the cover to read the Leelanau Vacation Guide.